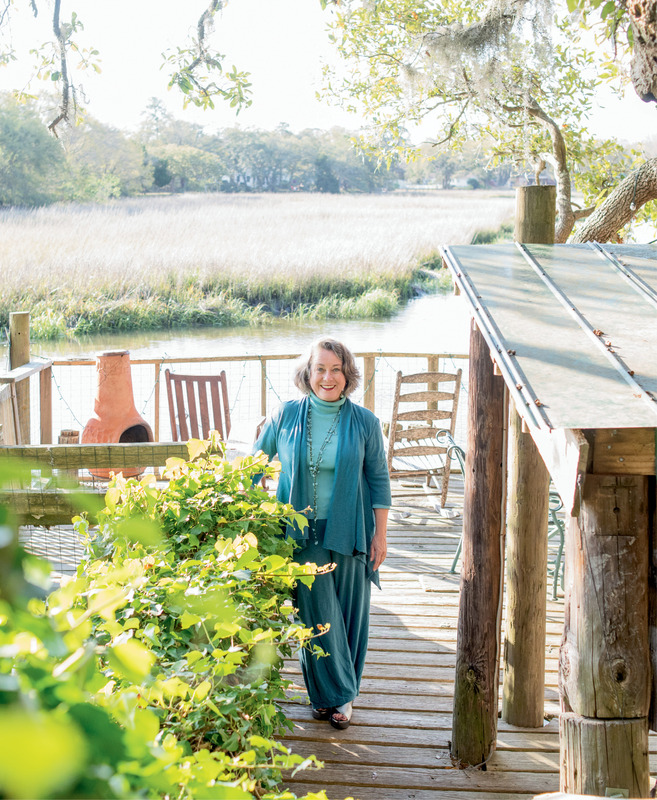 “I love to be outdoors,” says artist Mary Edna Fraser, pictured here on the dock of the James Island tidal creek property where she lives and works. 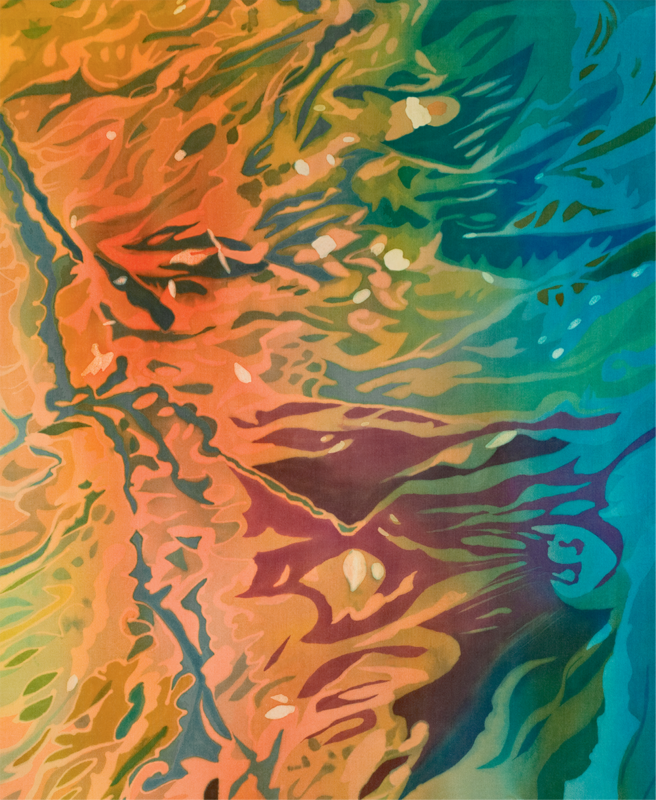 Her plein air oils and batiks, such as Gulf Oil Spill (batik on silk, 55 x 35 inches, 2014) evoke both the majesty and vulnerability of the natural world. 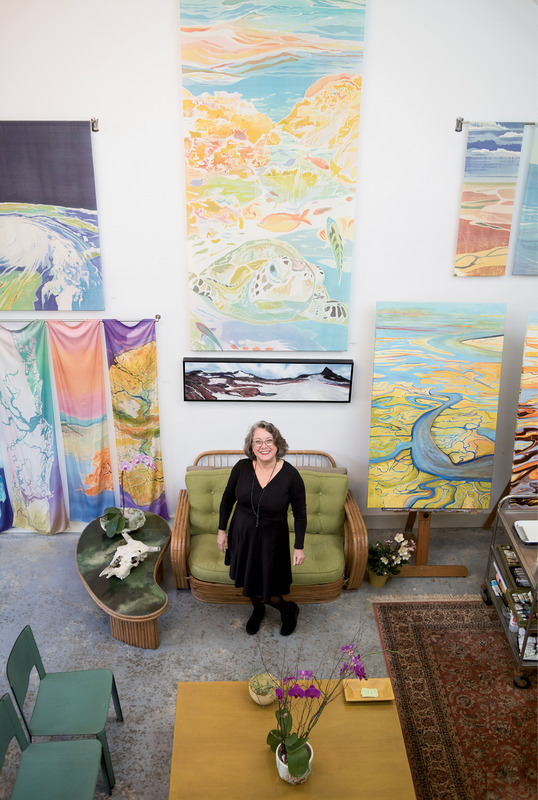 Looking Up: Fraser (photographed in her studio) brings an aerial perspective to her works, giving viewers a broader understanding of how human actions impact the landscape. 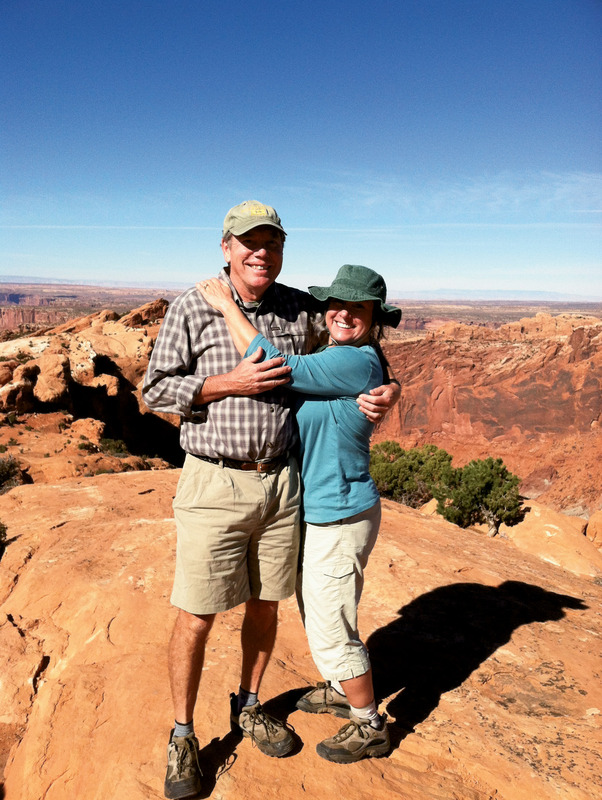 “I go where I feel I’m most needed,” she says, in choosing her subject matter. Down a quiet dirt lane off Folly Road, past an immense bank of azaleas shouting boisterous pink glory, you’ll find Mary Edna Fraser’s studio tucked under tall pines, amidst all sorts of wild beauty. Along a little path that leads through dogwoods and camellias to the front door, recycled lightbulb critters, the handiwork of Fraser’s friend and artist Jeff Kopish, poke out of the unruly garden. In a large clay planter-turned-makeshift pond, goldfish dart around in dark water. The artist bows over to peer in. “I feed them on my way into the studio every morning and say a little prayer as I toss in flakes of food,” Fraser says. Even the simplest act is infused with both whimsy and reverence. Fraser’s studio sits on the back of this wooded lot—where she lives with her husband, pediatrician John Sperry—overlooking a tidal creek. The lofty space, like its owner, exudes light and warmth and magic. “Check this out: I just got Halsey’s bones!” Fraser exclaims, playfully hoisting up a horse skull in one hand and some other mysterious skeletal artifact in the other, as if a Georgia O’Keefe image has leapt off a canvas. The “bones” were gifts from David Halsey, whose father, William—Charleston’s premiere abstract artist and namesake of the College of Charleston’s Institute of Contemporary Art—was, like most every other creative spirit in town, part of Fraser’s embracing orbit. Skulls aside, Fraser’s studio is filled with evidence of her prodigious energy. Her signature silk batiks—ethereal interpretations of undulating coastlines, mountain-scapes, and serpentine waterways—hang in long, graceful verticals. 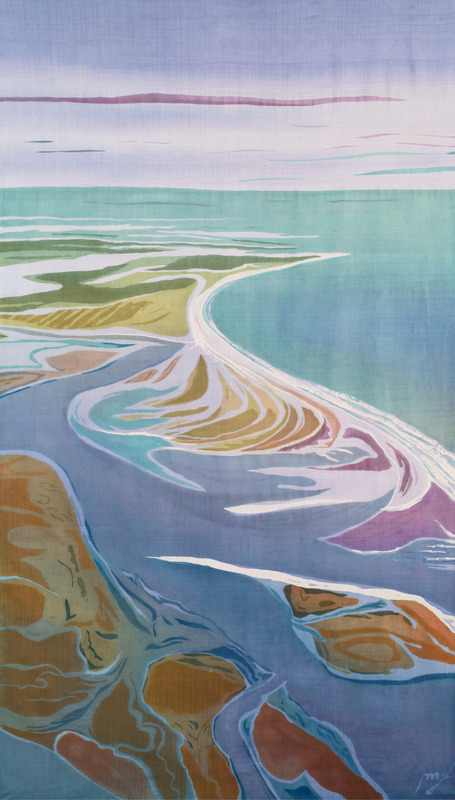 Books that she’s illustrated on climate change and barrier islands populate tabletops; file cabinets are filled with paper trails from decades of museum shows, commissions, and grants; a gallery wall showcases framed giclées and monotypes. And in the midst there are two large canvases where Fraser’s putting finishing touches on something new—her first large-scale aerial oil paintings. “I’m working on getting the darker colors right,” she says, tracing her hand along the twisting, writhing waterways outlined in deep reds and oranges—loud, urgent tones, a departure from the more soothing, lyrical batiks in hues of purple, blue, and green. 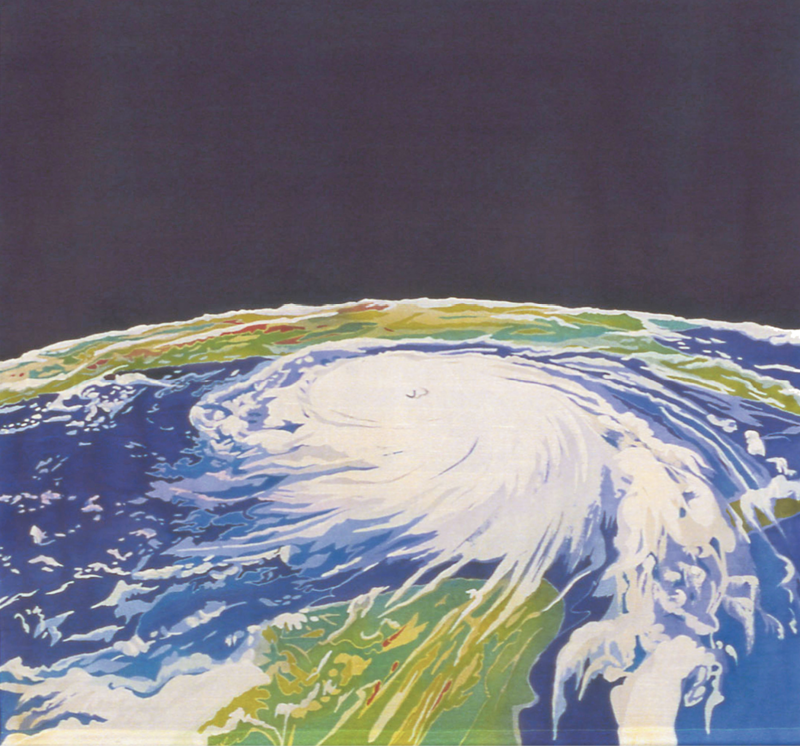 The canvas, Rising Tides, is one of three oils that Fraser is creating for “Awakening V,” an annual community art engagement produced by the nonprofit Enough Pie. Fraser serves on the steering committee for this year’s month-long program, “King Tide,” that presents a series of art installations, interactive events, and workshops (see the sidebar, “Awakening V: King Tide,” at the end) aimed at raising awareness of water vulnerability, particularly in Charleston’s upper peninsula, in light of sea level rise—an issue near and dear to this longtime artist-activist. Fraser grew up in Fayetteville, North Carolina, along the Cape Fear River. 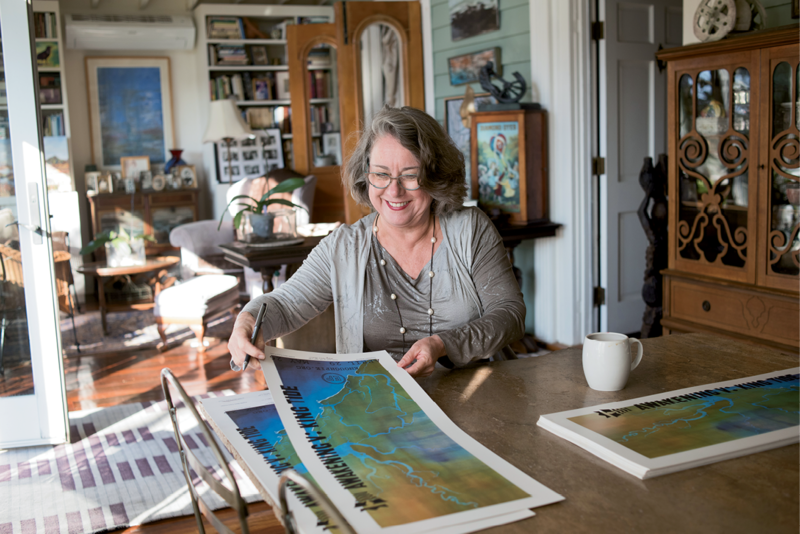 In addition to her three oil paintings that will be exhibited at the John L. Dart Library, Fraser’s hauntingly beautiful batik, Charleston Airborne Flooded, will be center stage during “Awakening V: King Tide,” cascading 98 feet down the 12-story facade of Joseph Floyd Manor—a hard-to-ignore depiction of what the peninsula will look like if current sea level rise trends continue. In addition to her coastal images, Fraser has recently begun using her megaphone to focus on the “unique and endangered treasures” that are our national parks, starting with oil paintings begun in July 2015 when she was invited to serve as artist-in-residence at Glacier National Park’s Sperry Chalet (no relation to Fraser’s husband). Fraser hiked in to the historic structure, a rugged backcountry outpost with no running water or electricity, and spent two weeks exploring the park’s trails, some days covering 13 miles or more. She scouted remote vistas and walked along retreating glaciers, taking photographs, sketching, and completing 14 plein-air paintings during her residency. The works from Glacier will be featured in an exhibit at Montana’s Hockaday Museum of Art in 2019 and are the beginning of an ongoing project Fraser is undertaking titled “Celebrating National Parks.” “My goal is to explore and paint each park, one at a time, and ultimately help catalyze further protection of these pristine, hallowed lands,” says Fraser, who has thus far visited 32 of the nation’s 59 “jewels,” with plans to travel to more locales, including lands recently added to Maine’s Acadia National Park. Ever since she was a Girl Scout who quickly earned enough badges to cover one sash and then filled up another, Fraser’s been an outdoorsy triple type “A”—adventurer, artist, activist. 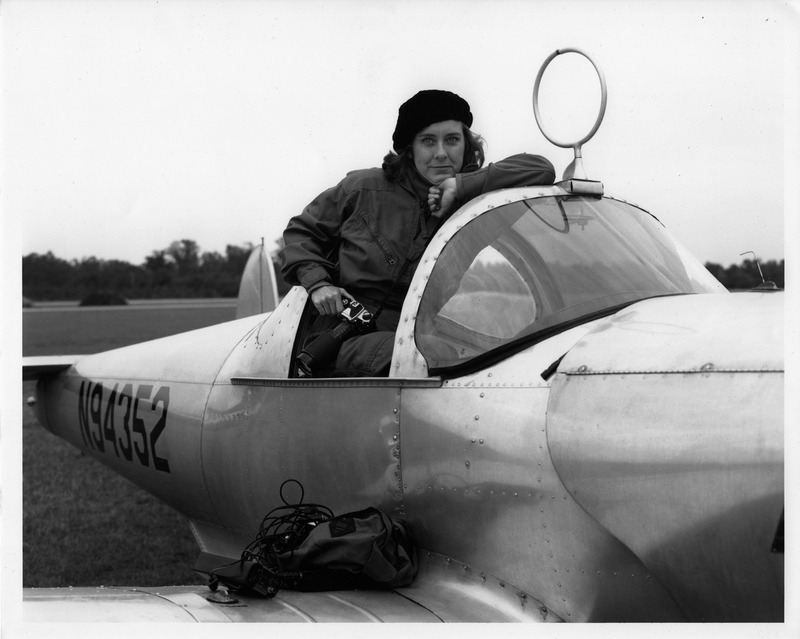 Her father, an electrical engineer and master pilot, took his daughter flying in his 1946 Ercoupe, from which she gained an expansive perspective of waterways and ecosystems and an appreciation for form, contrast, balance, and beauty. Her batiks capture this untethered, “floating world” sensibility, and even as her oil landscapes have a more grounded aesthetic, both are imbued with equal parts vulnerability and majesty. It’s as if she lives amidst multiple layers and speaks many languages at once, which may be why Fraser, a copilot from early on, is such a natural collaborator. “Mary Edna is a supporter, cheerleader, and creative partner, many times over, for me and countless other artists,” says her longtime friend and South Carolina Poet Laureate Marjory Wentworth, who has written poems inspired by Fraser’s work and featured it on the covers of her books. Fraser, in turn, has invited Wentworth to recite poetry at her art openings. Fraser’s batiks have served as backdrops for local modern dance companies and have been included in Earth Day worship services at area churches. Oh, and she plays a mean squeeze-box (and bass, guitar, banjo, and mandolin) and belts out robust, rollicking harmonies for the band Lime and the Coconuts, often performing at fundraisers for the Sierra Club or Coastal Conservation League, or just for fun. Fraser’s unfettered esprit de corps always lifts up the broader artistic community and is in part why she was presented the 2016 Elizabeth O’Neill Verner Award, the state’s highest honor recognizing “South Carolina artists who maximize their roles as innovators, supporters, and advocates of the arts.” But arguably her most significant and long-standing collaboration has been with an unlikely partner—a charmingly gruff, data-crunching geologist from North Carolina. 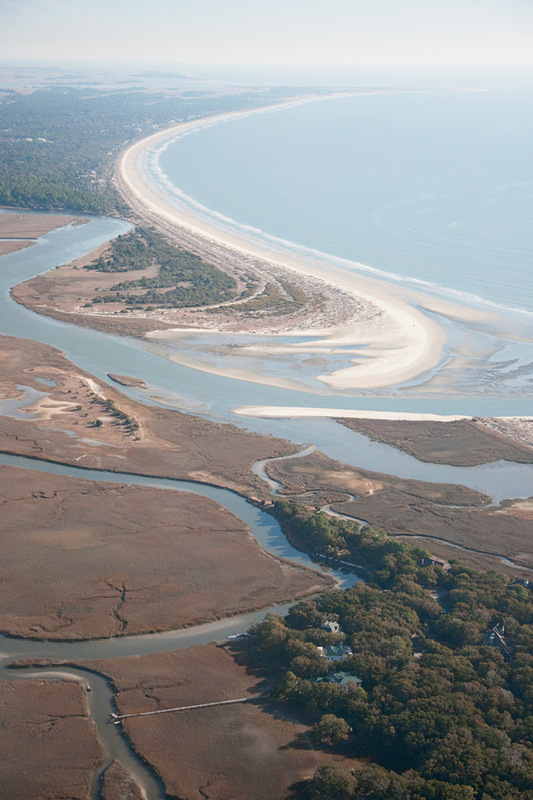 “In the late ’80s, I got this phone call out of the blue from an unknown lady asking if she could join me on a trip to Shackleford Banks,” recalls Orrin Pilkey Jr., a world renowned marine geologist and James B. Duke Professor Emeritus of Earth Sciences at Duke University’s Nicholas School of the Environment, who for decades took students on field trips to study the natural migration patterns of undeveloped barrier islands. Pilkey told the cold-caller, “Sure,” and thus began a friendship and partnership now three decades strong, with two critically acclaimed books (A Celebration of the World’s Barrier Islands, Columbia University Press, 2003, and Global Climate Change: A Primer, Duke University Press, 2011), 28 exhibitions, and numerous joint lectures and world travels to their credit. He’s the numbers, the science, the urgent prophet; she’s the vision, the emotion, the inspirer of hope and beauty. Fraser lovingly refers to Pilkey, now retired from teaching, as her “boss,” and the two “are now doing a full-court press on global climate change,” says the artist, who is working to get other university museums and galleries to present their traveling exhibit on climate change. Pilkey is slated to write an op-ed for The Post and Courier during “Awakening V” and will also provide scientific text to accompany Fraser’s oils on the National Park project. Led by a steering committee of diverse community leaders, including representatives from Charleston Resilience Network, Charleston Waterkeeper, City of Charleston, Coastal Conservation League, Cultivate, Historic Charleston Foundation, NOAA, Project Draw for Science, Robinson Design Engineers, South Carolina Aquarium, South Carolina Department of Environmental Control, and University of South Carolina Center for Science Education, “Awakening V: King Tide” presents multiple events across the Upper Peninsula and beyond. ■ Awakening Kickoff: People’s Climate Parade, April 29: Join the Saturday morning procession from The Royal American to St. Julian Devine Community Center. 9 a.m., 970 Morrison Dr.
■ “Wade in the Water,” May 6-June 10: Artist John Duckworth’s interactive, immersive multi-media installation links melting glaciers to Charleston’s flooded streets. Redux Contemporary Art Center, 1056 King St.
■ And Yet it Grows: Artist Kim Thomas, with help from Buist Academy students, creates a large sculpture from materials found during a series of New Market Tidal Creek cleanup days. The Royal American, 970 Morrison Dr.
■ Illuminate: Using both natural and artificial recycled materials, artist Vassiliki Falkehag creates an installation exploring the connection between the moon’s gravitation pull and societal contributions to flooding. 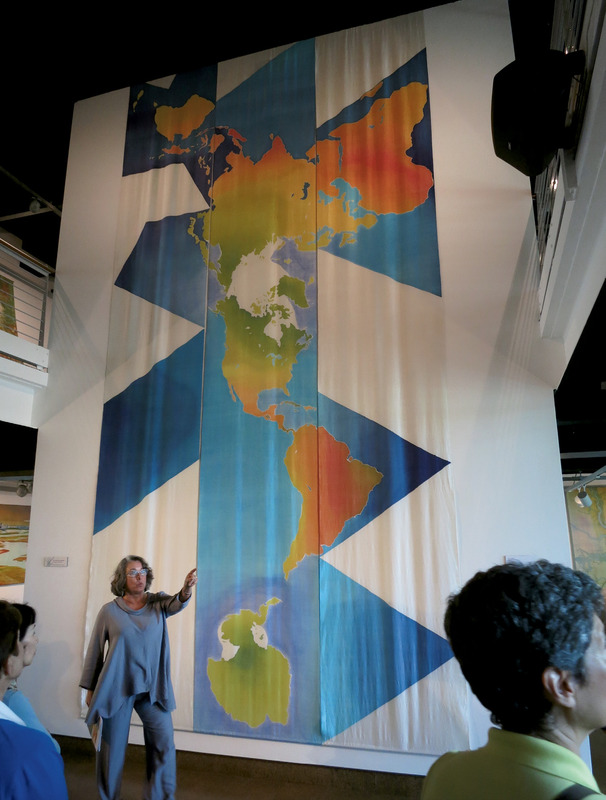 The Southern, 2 Carlson Ct.
■ Wave of Hope, April 28-May 25: The culmination of St. Julian Devine Community Center and Enough Pie’s weekly knitting circles is displayed, depicting levels of sea level rise projected by the year 2100. St. Julian Devine Community Center, 1 Cooper St.
■ “Under the Sea”: A mural project sponsored by The Nature Conservancy turns the wall at the Martin Luther King Jr. Pool into an aquatic wonderland, complete with an “I Pledge” section with actions kids can take to protect ocean health. Martin Luther King Jr. Pool, 155 Jackson St.
■ “Variable Boundaries”: Photographs by engineer and photographer Jared Bramblett and paintings by Mary Edna Fraser; John L. Dart Library, 1067 King St.
For a full list of programs and events, visit www.enoughpie.org.